Two of the most popular women in country music today are former American Idolwinner Carrie Underwood and teen sensation Taylor Swift. Carrie Underwood is the most popular country music artist and song writer from Checotah, Oklahoma and the winner of American Idol's fourth season. This girl rose to stardom with her powerful singing quality and performance. Her solo albums are hitting the top of charts continuously. Taylor Swift also a popular country pop artist, song writer and actress from Pennsylvania. Her albums are certified as multi-platinum with their huge success everywhere. 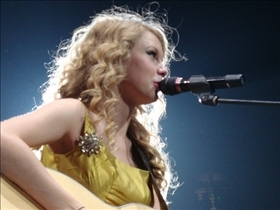 Taylor Swift's album titled ‘Fearless' attained the second to the top position in 2008. Both Carrie Underwood and Taylor Swift are immensely popular with their beauty and songs. Both women are extremely talented and will no doubt dominate the Billboard charts for years to come. Carrie Underwood rose to stardom as the winner of American Idol in the popular musical reality show's fourth season. Underwood's debut album titled ‘Some Hearts' released in 2005 and became a huge success. Her album ‘Carnival Ride' released in 2007 also topped the country charts and sold millions of copies. Underwood was also nominated for Video of the Year at the 2009 CMT Awards for "Just a Dream". According to Forbes magazine, Underwood is the top earning American Idol winner- getting paid around $14 million during the period 2008-2009. Underwood released her third single album "Play On" on 2009 and in the initial week it attained the #1 position on the Billboard 200 chart. Underwood became the third highest earning woman artist during the first week's sales for 2009. Taylor Swift started her career as a staff songwriter. Her music career started in 2006 with he release of her debut single "Tim McGraw". This song topped at number six on Billboard magazine's Hot Country Songs chart. In 2008, Taylor Swift released "Beautiful Eyes", this was sold exclusively at Wal-Mart. In the very first week of release, the album sold 45,000 copies. This was rated at #1 position on Billboard's Top Country Albums chart and on the #9 position on the Billboard 200. In the same week her self titled debut album topped out at number two on the chart. Swift thus became the first artist to embrace the top 2 positions in the country album charts. Underwood took home two Grammy awards for her debut album ‘Some Hearts' in the category of ‘Best New Artist' and ‘Best Female Country Vocal Performance' in 2006. In 2008 and 2009, Underwood also won a Grammy award for the Best Female Country Vocal Performance. And in 2010 she was awarded the Best Country Collaboration with Vocals, the fifth Grammy award of her career in consecutive years. Taylor Swift won a total of 59 awards in her career at present. Which includes a Grammy award for Best Country Album and Album of the Year for her album ‘Fearless' and Best Female Country Vocal Performance and Best Country Song for her album "White Horse' in the year 2008. Two popular county artists Carrie Underwood and Taylor Swift. Equally talented and celebrated female artists continually topping the country album charts. Underwood is the first ever winner of American Idol or any other competition to get a Grammy award for Best New Artist. Taylor Swift is the youngest artist ever to win the popular Grammy for Album of the Year. Underwood claimed Grammy award for the Best Female Vocal Performance in three consecutive years. Whos is the better singer? To compare these two is a mistake. Carrie is the full package and devouted to country. Taylor is a marketing genius heading to a big but short Pop career. Time will tell but I think Carrie will be around in 20 years and Taylor will have to settle for song writing after her marketing efforts die. Carnatic Music vs. Hindustani Music: What's the difference?